Portugal, birthplace of many famous explorers that have discovered India and the New world with the likes of Vasco de Gama and Pedro Alvares Cabral, is one of the first colonial empire and has become, recently, one of the top holiday destination in the world thanks to how successfully they have blended modernity and culture, their soil and the ocean and wilderness and urbanity. The country has been selected as the "Best travel destination in the world" for 2018! Southern region of Portugal, the Algarves famous for its creeks of white sandy beaches and turquoise water but also for its cultural heritage is one of the most visited region of this country, attracting thousands of people, especially during summer. 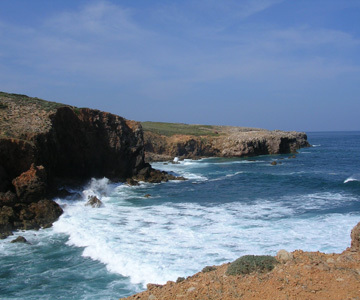 If the "far niente" holidays are not for you, discover the Natural Park of Costa Vicentina where the creeks, ochres cliffs and sand dunes share this unique and incredible landscape, perfect for hikes and cycling tours of the area ! Enjoy the mediteranean-like smell in the atmsophere, mixing the smell of pine trees, eucalyptus and other aromatic plants. Also, enjoy a visit and a stroll in the small streets of Faro and Lagos and circle around the medieval ramparts of Portimao to understand the sweet life of this Portugese region. Major city in Portugal, Porto is located at the delta of the Douro river in the north region of Portugal, is a prosperous, lively and colourful city that has many architectural and historical sites and monuments. As the famous say explains "While Lisbon is getting beautiful, Coimbra is studying, Braga is praying and Porto is working", the prosperity of this city comes from its exportations, especially of the sweet Porto wine, to the United Kingdom and later on to the rest of the world. As you most certainly already know, the town gave its name to this sweet wine that is produced in the city's back-country. In the region of Douro, a vast and hilly landscape where many hills, from 500 to 800 metres above sea-level, is where you can find the now prestigious vineyards that produce this wine. Enjoy the stress-free and traditional lifestyle of the locals. 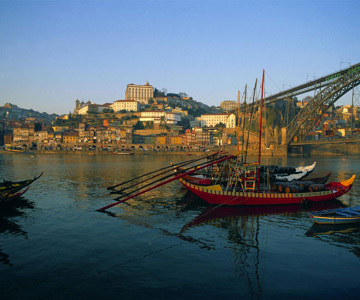 Also famous for its sports, Porto has one of the best football team in the country, the FC Porto ! Lisbon, global city and capital of the country, is a colourful town with incredible monuments that are globally known such as the Belém Tower, the Monastry of the Hiéronymites, the Castelo Sao Jorge and the amazing historical Alfama neighbourhood all linked by the famous yellow tramway, a real must-do, tethered to the urban landscape of Lisbon. A dynamic and historical city in which you can wander across the streets and neighbourhood that will satisfy all your needs ! 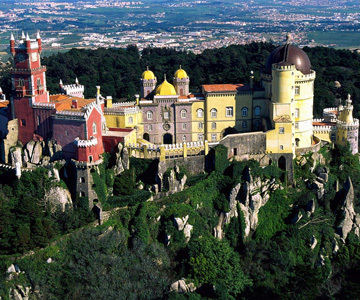 Next to the capital city of Portugal, you can enjoy an exceptionnal walk across the gardens and up to the Pena Castle, in Sintra, a one-of-a-kind colourful castle and also an incredible vantage point from which you can experience one of the best views over the area.